I’m at the Riesling Rendezvous conference in Seattle, Washington State. Held every three years, it’s an in-depth dive into this most distinctive of white wine grapes. It began on Sunday evening with a grand tasting outdoors at Chateau Ste Michelle in Woodinville, and yesterday and today we’re in Seattle for tastings and seminars. One topic that kept coming up yesterday in the first of two grand blind tastings was the discrepancy between analytic data and the taste of the wines. Specifically, we’re talking about residual sugar (in grams/litre), total acidity (in grams/litre) and pH. Riesling is often a low pH wine with levels hovering around 3, and sometimes dipping below. The TA can vary from 6 to around 10 g/l, and residual sugar varies more with Riesling than perhaps for any other variety. You’d think that a quick glance at the analysis would give you a clear idea of what to expect in the wine, in particular with regard to sweetness levels. But often this isn’t the case. Why? First, there’s that interaction between acidity and sweetness. They seem to balance each other out, to a degree. A wine with low acidity and low sugar may taste just as sweet as a wine with high acidity and quite a bit of sugar. The latter will seem richer an full bodied, but not necessarily sweet. But if this were all there were to it, you could plug sugar levels and acid levels into a database and come up with a level of perceived sweetness. There’s also the issue of fruitiness. Fruit flavours can taste quite sweet. How often have you used the term ‘sweet’ in the tasting note of an essentially dry wine? More than this, we are not measuring devices. The brain creates flavour after some interesting processing of the signals that come from the tongue, mouth and nose, and combines this information with input from vision and even hearing, and adds in information from our prior experience and our expectations. This computing happens below the surface, before we are consciously aware of what we are experiencing in our mouth and nose. One example of this sort of processing is our ability to perceive ‘sweet’ smells. Wines often smell sweet, but sweet is a taste. Our noses can’t taste sweet. What has happened is that through our experience we have come to associate certain smells with sweet tastes. A great example would be fruity smells. Young wines often have fruity smells, and with time these smells diminish. Thus older wines often taste less sweet because they have fewer of the fruity aromas. David Schildknecht, a wine critic specialising in Germany and Austria, talks of hidden sweetness in Riesling: this is in wines with quite high residual sugar, but they don’t display it. And Bob Bertheau, winemaker at Chateau Ste Michelle, says that his older Rieslings do dry out with time. These fruity aromas make what is in our mouths taste sweeter. It’s really interesting. You can illustrate this complex perception of sweetness by a simple experiment. Prepare four sugar solutions, but make one double the strength. To one of the normal strength solutions add some fruity esters (fruity smelling chemicals). To another add some acid. If people are asked to rank them in sweetness order they will typically put the double strength solution first. Then of the three single strength solutions, the one with the fruity aromas will taste sweetest, and the one with the acid will taste the driest. So trying to tell how sweet a Riesling will taste from the analysis alone is really difficult. How helpful do you think dry extract is in terms of “useful data”? 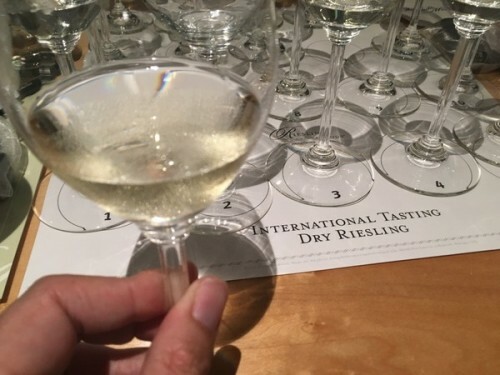 Sometimes Rieslings with similar RS levels can seem weightier on the palate, which for some translates into more of a sensation of sweetness, if they have a higher level of dry extract when comparing one to another. Again, the levels seem to vary considerably from one wine to the next, but I find that I like this little tidbit of data when considering wines that I am not able to actually taste.